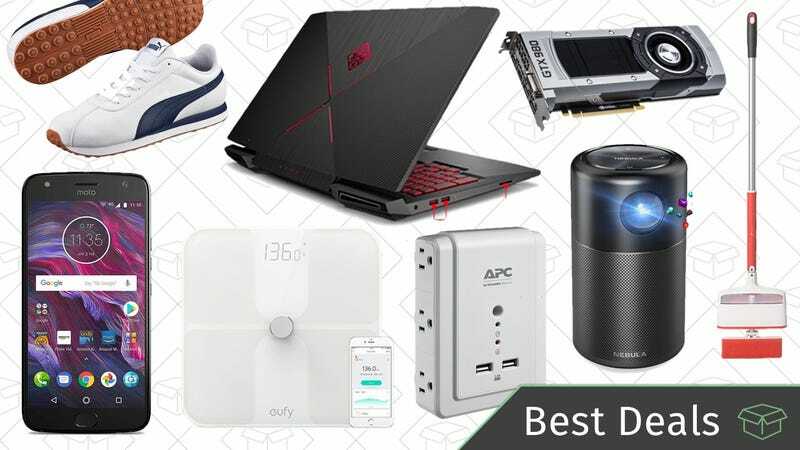 Grab deals on a portable projector, a Prime-exclusive Moto X phone, a refurbished gaming laptop and more. Anker, as you probably know by now, makes a lot of products. But I don’t think any of them are as ambitious as the Nebula Capsule, a surprisingly good portable projector shrunk down to the size of a soda can. At this size, the Capsule is obviously not as bright as a projector you’d permanently mount to your ceiling, and its standard definition resolution won’t dazzle, but it can run for hours on a charge, and has great audio built in, making it ideal for an impromptu outdoor movie night, or even as a replacement for your bedroom TV. I’ve played around with it, and you can see all of my thoughts here. For a limited time, the Capsule is marked down to $296 on Amazon, which is about $50 less than usual, and the best price we’ve seen since it was up for preorder on Indiegogo. It’s not hard to find good deals on VPN subscriptions, but our readers’ favorite service, Private Internet Access, is notable for hardly ever running sales. Just for our readers though, they’re opening back up their holiday offer of two years for $60, down from the usual $70. That’s just $2.50 per month to protect your browsing data, get around video geoblocks, circumvent proxy filters, and more. Whether you’re already a Verizon customer, or are looking to switch, they’re currently taking $100 off a wide variety of phones when you use promo code VZWDEAL at checkout. The catch is that you’ll have to sign on for Verizon’s device payment plan, which divides the price of the phone up into 24 monthly payments. Once you use the promo code, your $100 discount will also be split up over the same period, reducing your monthly bill by about $4 until the phone is paid off. You can see most of the phones here, but the same code should also work on the iPhone X and iPhone SE, which aren’t included on that page, for some reason. An SSD is one of the best upgrades you can buy for your computer (or PS4), and $230 is the best price Amazon’s listed on this 960GB drive in over a year. That’s not as cheap as it was before the worldwide NAND shortage began a couple of years ago, but otherwise, it’s a great deal. If you can stomach buying refurbished, Amazon’s got some seriously great gaming laptop deals in today’s Gold Box. You can choose between four different HP Omen machines ranging from $760 to $880, but I think the best value of the bunch is this $800 model, which features a quad core i7, a 1TB hard drive paired with a 128GB SSD, and a 4GB GTX 1050TI graphics card. It’s a little old, and this price is basically MSRP, but with crypto miners buying up every graphics card in existence, $298 for this graphics card counts as a deal. In terms of speed, the GTX 980 will actually be a little bit faster in most cases than the equivalent GTX 1060. If you’re in the market for a new Android handset, you won’t find a better deal than the latest Moto X for just $250. With IP68 dust and water resistance, dual rear cameras, Android 8.0, and even hands-free Alexa, it’d be a great phone at just about any price. This is the Prime-exclusive version of the Moto X, but as of a couple weeks ago, Amazon no longer includes lockscreen ads on these phones, so there’s really no downside to speak of here. Today’s price is $100 less than usual, but it’s only available today, and could very well sell out early. Wi-Fi range extenders can’t work miracles, but if there’s one spot in your house with spotty coverage, they can be a much cheaper solution than buying a new router. So at $35, why not give this one a try? We’ve seen it for less a few times in the past, but that’s still a solid deal. This plug-in surge protector from APC does exactly what you’d want it to do: Get out of the way. Its six outlets are mounted on the sides, so you can stick it behind furniture without providing extra clearance. There are also two USB ports (on the front, sadly) for your mobile devices. Clip the $5 coupon on the page to get it for $13, an all-time low. With its 24 hour battery life, impressive bass, and crystal clear sound quality, the Anker SoundCore has long been our readers’ favorite affordable Bluetooth speaker, and its water-resistant successor is down to $32 today, or $8 less than usual. The recent release of Qi-compatible iPhones means that wireless charging pads are flying off the shelves, and you can score Anker’s 10W model for $8 off today with promo code ANKER253. While it’ll only charge iPhones at 5W (which is fine for overnight charging), this 10W pad can fast-charge compatible Android phones as well. I bought it for myself late last year, and use it with my iPhone X every night. I love that the edges of the pad light up temporarily when you set your phone down, so I can be sure I placed it correctly even when I’m groggy and not wearing my glasses. Launched under Anker’s home brand, Eufy, the Genie smart speaker has Alexa built in, and mimics almost every feature of Amazon’s Echo Dot. That makes it a great deal at its usual $35, but at $20, you can afford to put them all around your home. Giant plugs that cover up half the outlets on your power strip should be outlawed, but until that day arrives, these short extension cords will have to do. $15 gets you a pack of 10 (with code ZT9MSNYF), which should be enough for even the most advanced home theater setups. Anker makes a smart plug now, because Anker makes everything, and today it’s discounted to just $14, $6 less than it was for Cyber Monday. Like pretty much all of these things, you can control or schedule it with both your phone and with Alexa, and its built-in energy monitoring is a great feature at this price. OXO made a fur-lifting brush for your rugs and carpets, which doesn’t seem all that interesting until you realize that it’s self cleaning. Every time you slide the housing back over the brush, it pushes all of the collected hair into a receptacle for easy removal. Shedding season starts soon, so today’s deal is perfectly timed. If you shop at Amazon with any frequency and have Amazon Prime, you should probably already have the Amazon Prime Visa card, which offers 5% back on all Amazon purchases, as well as 2% at restaurants, gas stations, and drug stores, and 1% everywhere else. But if those perks weren’t enough to tempt you in the past, Amazon just added Whole Foods to the 5% tier too. If you happen to do a lot of your shopping there anyway, that’s one of the best cash back offers we’ve ever seen on groceries, assuming you pay off the card every month. If, like me, you only use your Amazon card for Amazon.com purchases, and thus don’t carry it with you in your physical wallet, remember that all Whole Foods locations accept Apple Pay and Google Pay, so you can add the Amazon card to your mobile wallet and still enjoy this new perk. My Pillow makes our readers’ favorite pillows, and Woot is offering a rare deal today that should help your wallet rest easy. For between $50 and $55, you’ll get two My Pillows in the sizes of your choice, with either medium or firm fill. These aren’t exactly the same as the pillows that won our Co-op—they’re gusseted, meaning there’s a piece of fabric stretching around the edge of the pillow, rather than the top and bottom being sewn into each other—but the patented fill is the same. And in case you missed the (long overdue) news, Prime members now get free shipping on Woot orders, so that mandatory $5 fee is a thing of the past for most of you. With the flick of switch, this Worx machine transforms from a leaf blower to a mulcher to a vacuum. It’s not exactly the right season, but today’s price is an all-time low and about $30 less than usual, so it’s worth it to get it now and hold on to it for a couple of months. If a vacation to Africa has been on your radar, but you weren’t sure where to start planning, this travel package includes just about everything you need for a reasonable price, including flights. Gate 1 Travel (in partnership with Travelzoo) will fly you from the US to Nairobi, Kenya, which will serve as your home base for a five night wildlife sightseeing tour through the country, including two nights spent in the Masai Mara National Reserve. Your tours are included, as are your hotels, and most of your meals, and even restaurant tips. You will, however, have to provide your own camera. Prices start under $2,000 per person with promo code TZWESK, and tours are priced from New York, though you can leave from pretty much any US airport for an additional fee. Dates are available from now through November, so there’s plenty of flexibility here. A few steps up from the George Foreman grill you had in college, this multi-purpose grill is down $21 from its usual $80 price tag. This one functions as a grill, waffle maker, and panini press, with the classic adjustable fat-draining slope and drip tray, if you so choose. With the digital temperature control panel, you can set your cooking temperature between 325 - 450 degrees, and all the plates are removable and dishwasher safe, so it’s a great option for low-effort cooking. Update: The carts at sold out, but the storage containers are still in stock. Organize your backyard with Home Depot’s one-day sale on outdoor storage containers and a cart. The cart, which can haul up to 1,400 pounds, is the best deal, with a $90 discount when compared to its Amazon price. They’re also featuring a outdoor entertainment system, deck box, and vertical storage options, if you’re looking to tidy up outside. Just remember, this deal will only last through the end of the day, and some things are already selling out, so don’t delay. Typically priced around $40, this highly-rated Willow & Everett whistling stovetop tea kettle can be yours for just $33 today, the lowest price we’ve seen in over six months. Sure, there are easier ways to make tea, but if you prefer the traditional method, this tea pot is for you. Don’t blow your money on cheap tissues that will tear apart your face and nose. These Puffs tissues are ultra soft, moisturizing, or even sinus-clearing, and they’re all $2 off today when you Subscribe & Save. So, you might as well stock up for spring allergy season. Remember, you can cancel your subscription at any time after your first order ships. Discount will show up at checkout. There are few things more horrifying than running out of deodorant and realizing you don’t have a spare in your bathroom cabinet, but that won’t be an issue for quite awhile if you buy this 6-pack of Degree for just over $9. Be sure to clip the $2.50 coupon, and you’ll see the discount at checkout. Anker’s Alexa and Google Home-compatible smart bulbs have been massive hits with our readers, but the line’s been limited so far to white and tunable white bulbs, meaning color lovers had to stick to Philips Hue. That changed recently with the release of a Eufy white and color bulb, and you can stock up for $30 each today. That’s $6 less than usual, and more importantly, $20 less than the equivalent Hue bulb. Plus, you don’t need a hub to run them. Anker’s following up its incredibly popular dash cam with a new model, and you can race over to Amazon to snag one for $50, matching an all-time low. You can read my original Roav DashCam impressions here, but the C2 model has a few differences. Notably, it operates at a wider temperature range, so if you live in an extreme climate, this is the model for you. It also upgrades the screen from 2.4" to 3", and packs in a new Sony Exmor sensor and Ambarella A12 chipset. However, unlike the original, it doesn’t include Wi-Fi, so you’ll have to plug your microSD card into a computer to export your footage. Owning a label maker isn’t something you think about until you need one and don’t have it. And at $10, there’s no question that this Brother P-Touch Label Maker is something you should pick up. If you’re a pet parent, today’s the day to go on a Target shopping spree for food, cat litter, treats, rawhide bones, and other important essentials. For a limited time, if you spend $40 on pet supplies, you’ll get $10 off at checkout, and if you spend $60, you’ll get $15 off. If you hand wash a lot of dishes in the sink, Joseph Joseph’s clever washing basin helps you use less water, and its clever drain design lets water out while keeping food scraps in, so you don’t clog your plumbing. It usually sells for around $20, but you can pick it up for $16 today. Standing desks are great for you, but adding a balance board to the mix is a low-intensity way of strengthening your core and leg muscles while you fill out spreadsheets and expense reports. This one from Gaiam is designed specifically for standing desks, and it’s never been cheaper than it is today. There’s never a bad time to go to Spain, and you can do it for less than you might expect with this package from Great Value Vacations (in partnership with Travelzoo), plus a couple of bonus nights in Lisbon, Portugal. Every package includes roundtrip air from basically any US airport (prices will vary), and tons of dates are available from now through September. Once you’re over the Atlantic, you’ll have your hotels covered for three nights in Barcelona, three nights in Madrid, and two nights in Lisbon, plus transportation between the cities. At each destination, your breakfast is included (a buffet, no less), you’ll have private transfers to and from airports, and you’ll even get some private and guided tours of the must-see sights like the Sagrada Familia. Prices start at around $2,200 per person (based on double occupancy), which is a bit more than some other vacation packages, but between the air, the intercity transportation, the tours, and the hotel nights, it’s a lot cheaper than if you booked everything yourself. Magnetic smartphone vent mounts are the sleekest and easiest way to prop up your phone in the car, and you can get two mounts from Aukey for $8 today with code AUKEY007. Even if you already have these in your own car (a pretty safe bet! ), it’s worth keeping spares in your luggage for rental cars, or on your desk to use as a makeshift phone stand. Phillips’ insanely popular Wake-Up Light is here to change your life. Philips recently added an even higher end model to the lineup, which means we’re starting to see some massive deals on the old top dog, the HF3520. Grab it right now on Amazon for $73 after clipping the $25 coupon, the best price we’ve ever seen by about $12. Unlike an unsympathetic traditional alarm clock, the Philips Wake-Up Light eases you awake with a gradually-brightening light that simulates a natural sunrise, which is how humans are designed to wake up anyway. After the light gets you out of your REM cycle and ready to wake up, an audible alarm will finish the job at the time of your choosing. Plus, it also doubles as a very warm and pleasant reading light as you’re getting ready to go to sleep. It’s February, so you probably aren’t thinking about how you’re going to keep the mosquitos at bay... but you should be. I had been waiting to get some mosquito-free time with the Thermacell Radius since summer 2017, and unfortunately now that we finally have it, we’re still going to have to wait a few more months to test. That said, this is still the first EPA-approved, rechargeable mosquito repeller, and if you know you’re going to be spending time in enemy territory when things get warm, this is a great time to save some money with a preorder. Anker’s BodySense Smart Scale has been a hit since its release last year, and if it’s been on your wish list (and you’re not afraid to use it after Thanksgiving), you can pick it up for $33, one of the best prices we’ve seen. In addition to functioning as a normal digital bathroom scale, the BodySense can measure metrics such as body fat percentage and body water, and sync all of that data over Bluetooth to your iOS or Android smartphone. You can see my impressions here, but it’s the most seamless and reliable smart scale I’ve ever personally used, and a great deal at $33. Kickstarter’s a veritable design playground for wallet makers, and Bryker Hyde’s new Quick Draw wallet offers great features for minimalists, card hoarders, and self-hating, card-hoarding, wannabe minimalists like myself. You would technically consider this wallet a bifold, since it does fold in the middle, but since the spine of the wallet doubles as a money clip, it doesn’t have the added bulk of a cash pocket. And unlike most bifolds, this one makes full use of its outside face, with two quick draw card slots on either side of the spine. Three of those pockets block RFID signals, but one purposely lets them through, so you can use a hotel room key without taking it out of your wallet. Inside, you’ll find two more slots for cards, a transparent ID holder, and the aforementioned money clip. The whole package is exceptionally thin when empty, probably the thinnest folding wallet I’ve ever seen, but it was still totally usable after I stuffed nine cards plus an ID in there. The Quick Draw is already fully funded on Kickstarter with two weeks to go, and you can put a preorder in for $30, or get two of them for $50. We sort through the noise of Kickstarter to find you preorder discounts worth taking advantage of. Someone on our team has tested a prototype (or final version) of every Kickstarter we cover. If you just want to travel with one grooming tool that can do it all, Remington’s battery-powered PG6025 set includes a full-size trimmer, a foil shaver, a nose and ear trimmer, an 8-length hair clipping comb, and three beard combs for just $15. Just note that the $5 coupon on the page won’t be applied until checkout. Take this Stanley 16-quart cooler on your next adventure for just $40 today. It can keep up to 21 cans cold for up to 36 hours, doubles as a seat, and has a lifetime guarantee. The slump of February is upon us, and if you’ve been putting off going to the gym because the weather’s bad, time to give up. It’s getting nicer and nicer each day, and PUMA is having a massive Private Sale with major discounts on over 2,000 items. Let’s just say your wardrobe will look like it’s ready to hit the gym, even if you aren’t. The sunny weather is coming and it’s time to grab a new pair of shades. Get ready to get out into the sunshine with a new pair of Ray-Bans during Nordstrom Rack’s sale. With some pairs discounted over 60%, you’ll be able to find some that work for you. Just hurry up, because styles are already selling out. Amazon makes their own puffer down jackets now, because of course they do, and the entire line is on sale today for some of the best prices we’ve ever seen. You should be able to find all of the options here, but you can choose from vests, jackets, hooded jackets, and even full-length coats. You also get to pick from a bunch of different colors of each item. I ordered one of these late last year (the non-hooded men’s jacket), and it was very warm, but it did run a little big, so you might want to order a size down. Update: Now down to $8, after 25% off coupon. Crest 3D White Brilliance isn’t just toothpaste - it’s a two-step system for whitening your teeth. First, brush your teeth for one minute with the toothpaste from the Step 1 tube, then without rinsing, brush for another minute with whitening gel from the Step 2 tube. If you’re curious to try it out yourself, Amazon’s offering a 25% coupon on the system, bringing it down to $10 at checkout. Update: Today is the last day! If you need anything for the outdoors, Backcountry has it on sale. With up to 50% off a ton of stuff during their Semi-Annual Sale, there are thousands of items on sale. But, that’s not all. Head over to this section and you’ll get an extra 20% off select styles from Patagonia, Marmot, The North Face, and Mountain Hardware. Outerwear, boots, bags, and more are discounted, so maybe it’s time to think about going for a winter camping trip. Levi’s is a classic American denim brand, and they make your favorite pair of men’s jeans (no surprise there). Right now, they’re giving you an 30% off pretty much their entire site, including the sale section, from denim to outerwear and beyond, with the code SALE30. With prices like these, a Canadian tuxedo may even start to look appealing. Update: Ends at midnight tonight! You probably already got your Bean boots from last year and are ready for whatever 2018 throws at you (weather-wise, at least). But if you need to replace a few things, or you need a new pair, L.L.Bean is giving you 25% off any order of with the code GET25. Stave off what’s left of the winter weather in the best way you know how. Patagonia’s Web Specials section is always full of amazing discounts on gear you’ll actually want to use. For their huge Winter Sale, they’re taking to 50% off those Web Specials and past season products. If you were waiting to pick up winter gear until it was discounted, now is your chance. Nordstrom has only a couple large sales each year and today marks the beginning of their Winter Sale. Nordstrom is taking up to 40% off a boatload of styles for basically the rest of February. It’ll take time to look through all the stuff, so maybe pencil it in as a meeting at work or pretend you’re in the bathroom and avoid your family or something. Once again, Amazon is discounting a bunch of Kindle books down to $5 or less. This sale doesn’t really have a theme at all, but it does have some interesting reads, like an Agatha Christie murder mystery, Don Quixote, Most Dangerous, a book about the secret history of the Vietnam War, and a few books focused around Olympians. There a dozens of books to pick from, so I’m sure you’ll find something worth downloading. The new Rosetta Stone package lets you choose one of 24 different languages, and access all of Rosetta Stone’s lessons and content for that language for the next 12 months, including phrase books, stories, accent lessons, and more. Unlike some previous iterations of Rosetta Stone, this isn’t tied to a single device; you can access it on pretty much anything that has an internet connection. Today only, you can get the one-year subscription for $149 (about $10 less than its current price on Amazon), plus a Logitech wireless headset (which normally costs more than $60 on its own). Nearly a year after release, we’re finally starting to see things approaching deals on the Nintendo Switch. Today at Walmart, buy the console for MSRP, and get a $35 gift card for free. The 500GB Xbox One S Madden bundle is marked down to $230 right now on Amazon, or $50 less than usual, which I’m sure has everything to do with the unmarketable loser on the box art, and not the fact that the NFL season is over and they’re trying to get rid of old stock. If you missed out on Black Friday, PlayStation’s excellent VR bundles are back on sale today for the same price we saw during the holiday shopping season. $300 gets you the headset, camera and a copy of Doom, or for $50 more, you can add a set of Move controllers and get Skyrim instead. Don’t worry, that arrow in the knee isn’t real, it’s just a video game. While you can often find better per-month prices on Xbox Live Gold by buying 12 months at a time, if you’ve got commitment issues, Amazon’s discounting three-month membership cards to $15, down from their usual $25. It’s not quite as exciting as Civilization VI and Owlboy (and eventually Life Is Strange and Tacoma) like last month, but Dark Souls III and its Ashes of Ariandel DLC are a solid start to next month’s Humble Monthly. If you aren’t familiar, Humble Monthly is a $12/month subscription (or less if you purchase multiple months in advance) that unlocks a handful of games at the beginning of the month, plus more mystery games at the end of it. Even if you cancel, every game you’ve downloaded is yours to keep forever, making this one of the best deals in PC gaming.